This is a simple cocktail made with freshly squeezed blood orange juice, citrus vodka and orange liqueur like cointreau or triple sec. The blood orange tastes similar to raspberry but it also has orangy citrus flavor that helps making excellent martinis. Also, blood like color of it gives this martini a distinct looks. Rigorously shake all liquid ingredients in a cocktails shaker 1/2 filled with ice. 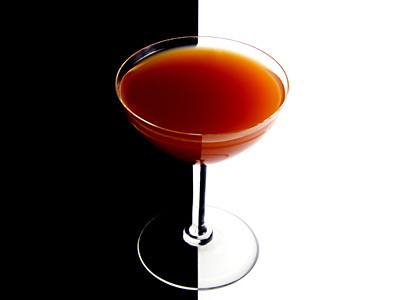 Strain and pour blood orange cocktail mix into chilled martini glass. Garnish with blood orange slice and serve. If juice is tart, then add 15 ml (1/2 oz) simple syrup. Use chilled martini glass and chilled ingredients to make best mixed drink. Use premium quality vodka so that impurities of it does not affect the taste. 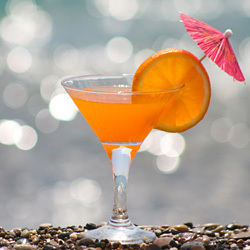 Serving Ideas: It is a party cocktail that can be enjoyed before dinner or with starters.